Just one week after Toshiba announced the first television with a 4K resolution, or a resolution of 3,840 x 2,160 pixels, Sony has gone and challenged it by unveiling a new home cinema projector that offers the exact same thing on a much larger screen. Sony, you cheeky devil! Known as the VW1000ES, this projector uses a new 4K SXRD, or Silicon X-tal Reflective Display, along with Sony's Iris3 technology in order to give you 12.5m pixel images at up to 200 inches in size. However, while this may seem like something truly magnificent and fantastic, there is one major drawback, the complete lack of 4K video content. However, despite the lack of content, this projector does offer some great features. It is a full HD and 3D projector and uses an active shutter system as well as a built-in transmitter for full HD content. Just because there isn't any 4K content out at the moment does not mean that you can't enjoy some full 1080p HD or 3D content while you wait. The main appeal with this device, at least for movie fans, is its ability to upscale regular Blu-ray movies to 4K resolution. This is all thanks to Sony's proprietary "Reality Creation" chip located in the device. The result of quadrupling the resolution is a "more immersive, engaging visual experience" according to Sony who added, "It should be like stepping up from DVD to Blu-ray all over again." 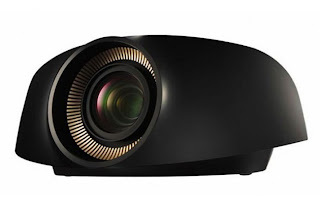 The VW1000ES 4K projector from Sony follows the more recently announced VW95ES and HW30ES and is set to hit the UK market first in January 2012. Pricing is still unannounced but I wouldn't expect this thing to be cheap. Expect to pay well over anything you would pay now for a top of the line projector.